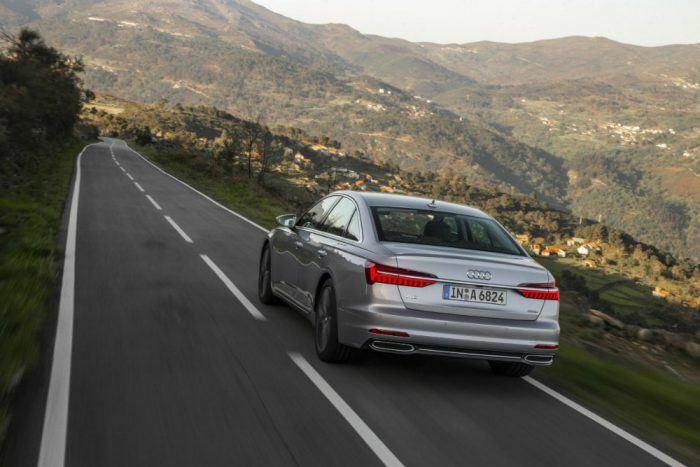 The 2019 Audi A6 marks the eighth generation of the automaker’s midsize sedan. New twin-turbo V6 features a higher compression ratio for greater torque. Audi’s Mild Hybrid Electric Vehicle technology is an integral part of the A6. However, Audi is pushing what they call “Digitalization” more so than anything else. 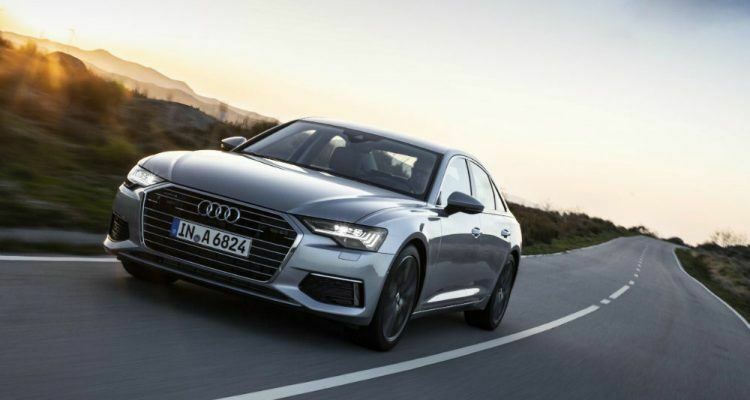 Audi just rolled out their latest A6 and it seems to be a worthy successor to the previous seven generations of the Ingolstadt company’s midsize sedan. It’s got all the engine and drivetrain goodies you expect, but the latest A6 is all about Digitalization. Yup, you heard me: Digitalization. We’ll get to what on Earth the marketing guys are up to with this whole “Digitalization” thing, but for now, let’s examine all the good gearhead stuff: the engine and chassis. The latest A6 features a new 3.0-liter TFSI V6 that cranks out more power and weighs 30 lbs. less. Said plant puts out 335 horsepower and 369 lb-ft. of torque. Bottom line: zero to 60 mph in 5.1 seconds. Not bad for a big-ish sedan. There’s a twin-scroll turbocharger nestled inside the V of the engine to improve responsiveness and performance. The Audi valvelift system changes the duration of the valve opening depending on the throttle and engine speed. The high compression ratio of 11.2:1 means greater torque, of course, and also means you’ll most likely have to run premium gas. The seven-speed S tronic dual-clutch automatic now transfers power to a quattro with “ultra” technology. No, seriously, they said that. “Ultra” technology, it would seem, is optimized for performance and efficiency and allows for intelligent, proactive control of the all-wheel drive system to help “predictively modify the torque application as the driver demands or the road conditions require.” Sure. Whatever. The 2019 Audi A6 will come standard with Mild Hybrid Electric Vehicle technology. This 48-volt system, stored under the rear cargo floor, takes power from the 10Ah battery to a belt alternator starter to enhance the start/stop system. Strangely a conventional starter is used for cold starting. The A6’s powertrain is remarkably similar to the new A7. The 2019 Audi A6 uses lightweight aluminum and high-strength steel for better torsional rigidity. Heavier materials, crucial to vehicle rigidity, are closer to the center for better handling and chassis response, according to Audi. Photo: Audi of America, Inc.
Now, about that “Digitalization” thing. Digitalization (which doesn’t come up as a spelling error, interestingly enough) is Audi’s catchphrase for tying a whole bunch of tech together through their MMI interface. The MMI touch response replaces the old rotary dial and conventional buttons and controls with large, high-resolution touch displays: an upper 10.1-inch display controls the infotainment and a lower, 8.6-inch display for climate control, comfort, and convenience functions. It gets even more goofy from there, unfortunately. The lower display has “natural handwriting input with whole-word recognition.” Audi says that users can write a word left to right, or in one spot, and the MMI is designed to identify each letter. They make no mention on the efficacy of doing this while in motion. If that’s not enough, there’s a full QWERTY keyboard for input. The upper display works more or less like an iPad, with drag-and-drop features and up to 32 shortcuts for different functions. 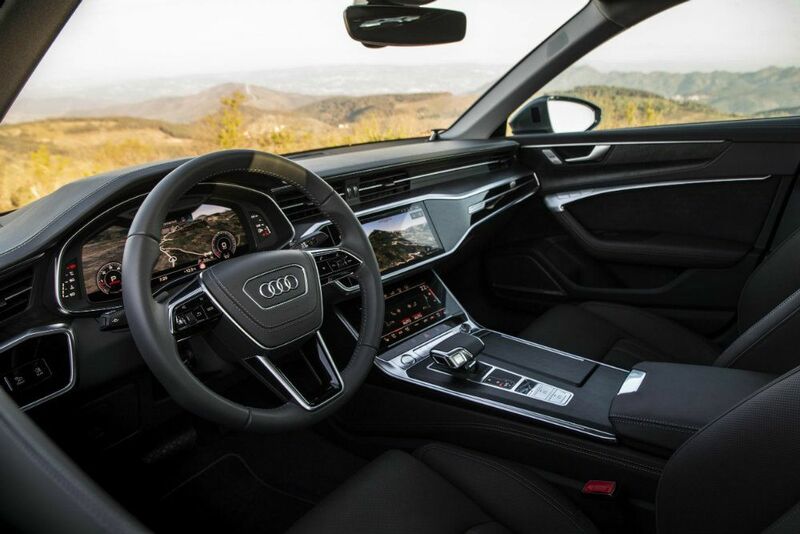 2019 Audi A6 interior layout. Photo: Audi of America, Inc.
And all this is just the start of the tech goodies along for the ride. Other features include the Audi virtual cockpit’s 12.3-inch display with HD resolution and two viewing modes: classic and infotainment (ugh). There’s an available Audi phone box to connect smartphones with the vehicle’s antenna to charge them inductively. Prestige trim levels get a standard, full-color heads-up display. Apple CarPlay and Android Auto integration is standard. Standard on Premium Plus and Prestige is a Bang & Olufsen Premium 3D Sound System. On Prestige models you get a Bang & Olufsen 3D Advanced Sound System, which delivers the tunes through 19 speakers, powered by a 19-channel BeoCore amplifier and ICE power amplifiers with an output of 1,820 watts. Not all that bad, considering. The 2019 Audi A6 starts at around $59,000 for the Premium package and goes all the way up to a little over $67,000 for the full-zoot Prestige package. No Comments on "2019 Audi A6: The Digital Age Has Arrived"